Now that we've met the rogues of Star Wars Rebels, the Ghost's crew attempts a good old-fashioned heist. They run into a pair of familiar droids—R2-D2 and C-3pO—but what are they doing with an Imperial agent? First off, I'm glad that the animators seem to have gotten Ezra's hair under control. I am now less afraid that it's going to come to life and eat his brain. As our second episode opens, the crew is fleeing a pickup gone bad. They're low on food, gas, and explosives. It's time for a little crime. Kanan learns of a shipment of something that the Empire is buying up, and the crew plans a con. You see, the trade deal involves a certain protocol droid translator and his astromech companion. Yep, these two again. The Rebels logo flashes on screen as if their appearance is the punchline to a joke. All Chopper has to do is be his normal charming self, and he gets all the droids bumped to the back of the shuttle. Then it's Sabine's time to shine. Really, she couldn't have changed into more sedate clothing? Or spray-painted her armor black? Sabine does a bit of creative translating and misdirects the Imperial agent, ensuring that the Ghost's crew reaches the shipment first. That's when we learn what's inside and get a little character development moment. Sabine doesn't fetishize weapons (she's eager to blow them up when the opportunity presents itself), but she does admire them. She can't wait to get her hands on the disruptors and blurts out what is, in her mind, the coolest thing about them: that they can disable a ship. Zeb, on the other hand, for all of his apparent toughness, treats the crate as if it bit him. They are a tangible sign of the horrors of war he experienced. The reason we don't see other Lasats hanging around is that the Empire cleared their home planets—and rather brutally. Zeb is one of the few remaining survivors of his species. This revelation gives Ezra an emotional connection to Zeb that he didn't have before, a way to understand the Lasat's gruffness and rage. That becomes important later. 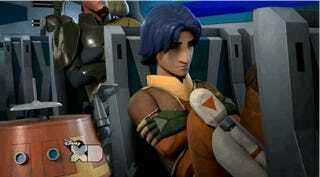 Zeb has his doubts about selling the disruptors, but Kanan figures the crew has got to eat. But C-3PO puts a wrench in the plans by playing to type: feeling he has been kidnapped, he summons Agent Kallus to come rescue him. The rebels may be hiding a rogue Jedi in their midst, but it's Zeb that makes them readily identifiable. And while the Inquisitor may be the Jedi hunter, Kallus has a particular bloodlust when it comes to the Lasat. He rushes to Lothal to take back the stolen shipment and finish off Zeb in the process. Kallus nearly gets in his killing blow, too, except that Ezra, surging with feeling for his new friend, taps into the Force and pushes Kallus away. When Kanan tells Ezra that it's time for him to begin his Jedi training in earnest, it's couched as a reward, but I wonder how Kanan will deal with the issue of controlling one's emotions, especially without the Jedi order. Kanan returns the wayward droids to their true owner, who is, of course, Senator Bail Organa. Bail is using his droid pals as spies against the Empire. He also employs a Jedi phrase as a sort of coded signal for Kanan, a sign that he is a friend. Like a lot of people, I had my doubts about bringing R2-D2 and C-3PO in so early in the series. They're all over Clone Wars and they're not always a value-add. But it's actually nice to see how Rebels connects to Revenge of the Sith at this point in the game Plus, not every non-evil prequel character can just cool their heels and learn how to transcend death. It also makes sense that the Rebels would connect with Bail Organa in particular; after all, his adopted daughter Leia is going to become a major player in their Rebellion.